Donald Miller MD is a cardiac surgeon and Professor of Surgery at the University of Washington in Seattle. Another influenza season is beginning in the northern temperate zone, and our government’s Center for Disease Control and Prevention (CDC) will strongly urge Americans to get a flu shot. Health officials will say that every winter 5—20 percent of the population catches the flu, 200,000 people are hospitalized, and 36,000 people will die from it. The CDC’s 15-member Advisory Committee on Immunization Practices (ACIP) makes recommendations each year on who should be vaccinated. Ten years ago, for the 1999—2000 season, the committee recommended that people over age 65 and children with medical conditions have a flu shot. Seventy-four million people were vaccinated. Next season (2000—01) the committee lowered the age for universal vaccination from 65 to 50 years old, adding 41 million people to the list. For the 2002—03 season, the ACIP added healthy children 6 months to 23 months old, and for 2004—05, children up to 5 years old. For the 2008—09 season the committee has advised that healthy children 6 months to 18 years old have a flu shot each year. Its recommendations for influenza vaccination now covers 256 million Americans — 84 percent of the U.S. population. Only healthy people ages 19—49 not involved in some aspect of health care remain exempt. Pharmaceutical companies have made 146 million influenza vaccines for the U.S. market this flu season. Almost all the ACIP members who make these recommendations have financial ties to the vaccine industry. The CDC therefore must grant each member a conflict-of-interest waiver. The CDC mounts a well-orchestrated campaign each season to generate interest and demand for flu shots. Along with posters for the public, flyers, and health care provider materials, it encourages doctors to “recommend/urge flu shots.” Medical groups, nonmedical organizations (like the YMCA), and the media trumpet CDC-released messages on influenza, notably: “Flu kills 36,000 per year,” “This could be a bad/serious flu year,” and “Flu vaccine is the best defense against flu.” The government promotes National Vaccination Week, which this year is December 8—14. This year, however, rather than uniformly following the government’s “Seven-Step Recipe” for generating demand for flu shots, the mainstream media has questioned their benefits. The New York Times had an article in the September 2, 2008 issue titled “Doubts Grow Over Flu Vaccine in Elderly,” which says, “The influenza vaccine, which has been strongly recommended for people over 65 for more than four decades, is losing its reputation as an effective way to ward off the virus in the elderly. A growing number of immunologists and epidemiologists say the vaccine probably does not work very well for people over 70, the group that accounts for three-fourths of all flu deaths.” The article refers to a study done by the Group Health Center for Health Studies in Seattle on 3,500 people, age 65—94, to determine if flu vaccines are effective in protecting older people against developing pneumonia (Lancet 2008;372:398—405). The National Vital Statistics Reports compiled by the CDC show that only 1,138 deaths a year occur due to influenza alone (257 in 2001, 727 in 2002, 1,792 in 2003, 1,100 in 2004, and 1,812 in 2005). Bacterial pneumonia causes some 60,000 deaths each year, mainly in the winter, when surveillance data show increased prevalence of the flu virus. Using a mathematical (Poisson) regression model, officials estimate that the flu virus triggers some of the winter-time deaths from pneumonia, along with deaths in people with cardiovascular disease and other chronic illnesses. More than 34,000 of those “36,000” flu deaths are what officials estimate are “influenza-associated” pneumonic and cardiovascular deaths. The Group Health study reported in the New York Times and other newspapers around the country found that flu shots do not protect elderly people against developing pneumonia. Pneumonia occurs with equal frequency in people over age 65 with or without a flu shot. Earlier studies, biased by the “healthy user effect,” over-estimated the vaccine’s effect on pneumonia because they did not adjust for the presence and severity of other diseases in unvaccinated people. As the Group Health authors point out, “The study found that people who were healthy and conscientious about staying well were the most likely to get an annual flu shot. Those who are frail may have trouble bathing or dressing on their own and are less likely to get to their doctor’s office or a clinic to receive the vaccine. They are also more likely to be closer to death.” Other investigators question that there is a mortality benefit with influenza vaccination. Vaccination coverage among the elderly increased from 15% in 1980 to 65% now, but there has been no decrease in deaths from influenza and pneumonia (Am J Respir Crit Care Med 2008;178:527—33). As one vaccine researcher puts it, “I think the evidence base [for mortality benefits from flu shots] we have leaned on is not valid” (Lancet Infect Dis 2007;7:658—66). There is also a lack of evidence that young children benefit from flu shots. A systematic review of 51 studies involving 260,000 children age 6 to 23 months found no evidence that the flu vaccine is any more effective than a placebo (Cochrane Database Syst Rev. 2006;1:CD004879). Randomized controlled trials are the most reliable way to determine the efficacy — and safety — of a given treatment. No randomized trials show that flu shots reduce mortality from influenza or flu-related pneumonia. Some do show that the flu vaccine is somewhat effective in preventing influenza. In one widely quoted study, 1838 volunteers age 60 and over were randomized to receive a flu shot or placebo (a shot of saline). The flu shot reduced the relative risk of contracting (serologically confirmed, clinical) influenza by a seemingly impressive 50%. The incidence of influenza in the unvaccinated people in this study was 3%. In the vaccinated group it was 2% (JAMA 1994;272:1661—5). Flu shots reduced the absolute risk of contracting influenza by a meager 1% (not 50%, as the “relative risk” portrays it). In actuality, for every 100 people that have a flu shot only one will benefit from it — this, in medical parlance, is the “number needed to treat” (NNT) in order to achieve any benefit from the treatment. A flu shot provides no benefit for the other 99 people — 2 of them will get influenza anyway — and all 100 risk being harmed by the vaccine. Another randomized trial by Zaman and coworkers published recently (NEJM 2008;359: published online September 17, in print October 9) found that the incidence of influenza in infants whose mothers had a flu shot during their pregnancy was 4% (6/159). The incidence of flu in infants whose mothers did not have a flu shot was 10% (16/157). In this study (done in Bangladesh and funded by the Bill and Melinda Gates Foundation, Wyeth Pharmaceuticals, and others) flu shots reduced the relative risk of influenza illness in infants by a seemingly impressive 63%. But only 6 out of 100 infants benefited from the shot. The other 94 received no benefit — 4 got influenza anyway — and all are at risk from being harmed by the vaccine, particularly from the mercury, aluminum, and formaldehyde in it. After officials select the three strains of flu virus that they think are most likely to be circulating during the next winter season (they picked the wrong ones last year), vaccine makers grow the viruses in fertilized chicken eggs, with 500,000 eggs per day (each examined by hand) for up to eight months. Formaldehyde is used to inactivate the virus. It is a known cancer-causing agent. Aluminum is added to promote an antibody response. It is a neurotoxin that may play a role in Alzheimer’s disease. Other additives and adjuvants in the flu vaccine include Triton X-100 (a detergent), Polysorbate 80, carbolic acid, ethylene glycol (antifreeze), gelatin, and various antibiotics — neomycin, streptomycin, and gentamicin — that can cause allergic reactions in some people. Two-thirds of the vaccines made for the 2008—09 flu season, 100 million of them, contain full-dose thimerosal, an organomercury compound, which is 49% mercury by weight. (An unidentified number of the other 50 million vaccines contain either “no” or “trace” amounts of thimerosal.) It is used to disinfect the vaccine. Each one of these 100 million flu shots contain 25 micrograms of mercury, a mercury content that is 50,000 part per billion, 250 times more than the Environmental Protection Agency’s safety limit. Mercury is a neurotoxin, which has a toxicity level 1,000 times that of lead. Mercury in vaccines has also been implicated as a cause of autism. 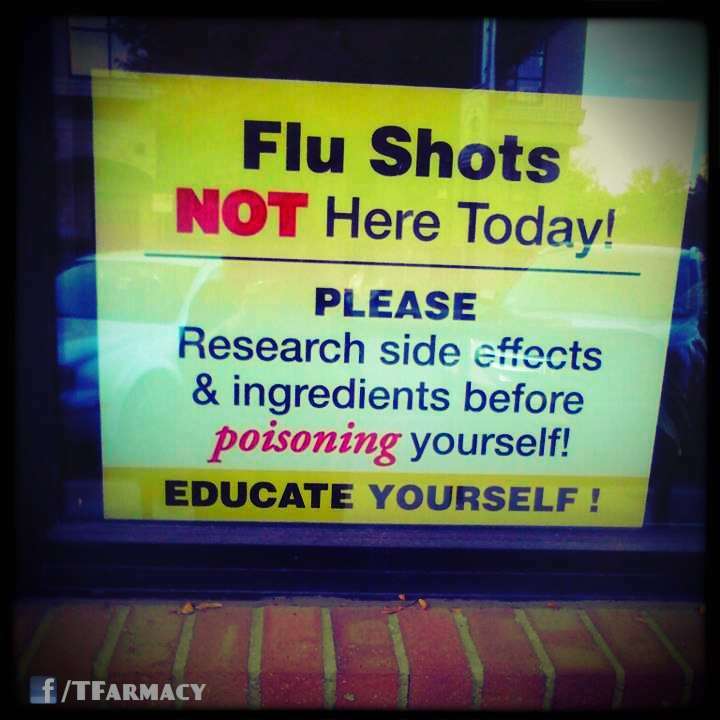 Vaccine makers have now removed thimerosal from all childhood vaccines, except flu shots. For more on this subject see my article “Mercury on the Mind,” with its recommended reading list, and Evidence of Harm: Mercury in Vaccines and the Autism Epidemic: A Medical Controversy by David Kirby. The package inserts that come with the flu vaccine note that GBS is a potential complication. There are 1 to 2 cases of GBS per 1 million vaccinated persons. (There were 10 times that many cases of GBS in 1976 with the flu vaccine used that year). Taking a flu shot is essentially the same as buying a lottery ticket for acquiring Guillain-Barré syndrome. Seventy percent of doctors do not get a flu shot. Flu virus exists in people year-round, and new strains seed a population during the “off-season.” In the northern and southern temperate zones, flu epidemics occur in the cold part of the year, October—March and April—September respectively. Flu epidemics occur in the tropics during the rainy season. Explanations for why flu epidemics occur in the winter when it is cold — people being indoors in close contact, drier air dehydrating mucus and preventing the body from expelling virus particles, the virus lingering longer on exposed surfaces, like doorknobs, with colder temperatures — do not explain why flu epidemics occur in the tropics. Something that can explain why flu epidemics also occur both in warm and cold climates is this: During a flu epidemic, wherever it may be, the atmosphere blocks ultraviolet B (UVB) radiation from the Sun. In the temperate zones above latitude 35 degrees North and South, the sun is at a low enough angle in the winter that the ozone layer in the atmosphere absorbs and blocks the short-wavelength (280—315 nanometers) UVB rays. In the tropics during the wet season, thick rain clouds block UVB rays. Skin contains a cholesterol derivative, 7-dehydrocholesterol. UVB radiation on skin breaks open one of the carbon rings in this molecule to form vitamin D. The activated form of vitamin D (1,25-dihydroxyvitamin D) attaches to receptors on genes that control their expression, which turn protein production on or off. Vitamin D regulates the expression of more than 1,000 genes throughout the body. They include ones in macrophages, cells in the immune system that, among other things, attack and destroy viruses. Vitamin D switches on genes in macrophages that make antimicrobial peptides, antibiotics the body produces. Like antibiotics, these peptides attack and destroy bacteria; but unlike antibiotics, they also attack and destroy viruses. Vitamin D also expresses genes that stop macrophages from overreacting to an infection and releasing too many inflammatory agents — cytokines — that can damage infected tissue. Vitamin D, for example, down regulates genes that produce interleukin-2 and interferon gamma, two cytokines that prime macrophages and cytotoxic T cells to attack the body’s tissues. In the 1918—19 Spanish flu pandemic that killed 500,000 Americans, young healthy adults would wake up in the morning feeling well, start drowning in their own inflammation as the day wore on, and be dead by midnight, as happened to my 22-year-old grandmother and my wife’s 24-year-old grandmother. Autopsies showed complete destruction of the epithelial cells lining the respiratory tract resulting, researchers now know, from a macrophage-induced severe inflammatory reaction to the virus. In a terribly misguided way, these victims’ own immune system attacked and killed them, not the virus, something in future pandemics vitamin D, in appropriate doses, can prevent. A creditable hypothesis that explains the seasonal nature of flu is that influenza is a vitamin D deficiency disease. Cannell and colleagues offer this hypothesis in “Epidemic Influenza and Vitamin D” (Epidemiol Infect 2006;134:1129—40). They quote Hippocrates (circa 400 B.C. ), who said, “Whoever wishes to investigate medicine properly should proceed thus: in the first place to consider the seasons of the year.” Vitamin D levels in the blood fall to their lowest point during flu seasons. Unable to be protected by the body’s own antibiotics (antimicrobial peptides) that this gene-expresser engineers, a person with a low vitamin D blood level is more vulnerable to contracting colds, influenza, and other respiratory infections (e.g., respiratory syncytial virus). Studies show that children with rickets, a vitamin D-deficient skeletal disorder, suffer from frequent respiratory infections; and children exposed to sunlight are less likely to get a cold. Given vitamin D’s wide-ranging effects on gene expression, other studies, for example, show that people diagnosed with cancer in the summer have an improved survival compared with those diagnosed in the winter (Int J Cancer 2006;119:1530—36). The increased number of deaths that occur in winter, largely from pneumonia and cardiovascular diseases, are much more likely due to vitamin D deficiency than to an increased prevalence of serologically-positive influenza virus (which also results from vitamin D deficiency). Experts reckon that an optimum blood level of vitamin D (25-hydroxyvitamin D) is 50—99 ng/ml. (Children need a blood level >8 ng/ml to prevent rickets. It takes a concentration >20 to maintain parathyroid hormone levels in a normal range. A level >34 is needed for peak intestinal calcium absorption. And in elderly people neuromuscular performance steadily improves as vitamin D blood levels rise to 50 ng/ml.) The government’s recommended daily allowance (RDA) for vitamin D is 400 IU (international units) a day, an amount sufficient to prevent rickets and osteomalacia but not vitamin D’s other gene-regulating benefits. To achieve all of vitamin D’s benefits one has to take an amount ten times the government’s RDA — 4,000 to 5,000 IU a day. A light-skinned person will synthesize 20,000 IU of vitamin D in 20 minutes sunbathing on a tropical beach, at which point vitamin D synthesis shuts down for the day (it takes a dark-skinned person 6 to 10 times longer to make this amount). Human breast milk does not contain vitamin D, since, from an evolutionary standpoint, our African ancestors’ infants, reared near the equator, could readily synthesize this gene regulator from sunlight in their skin. Food contains very little vitamin D. (The highest concentrations are in wild salmon, mackerel, sardines, and cod liver oil.) Federal regulations now require that some foods, like milk, be fortified with vitamin D. But one would have to drink 200 glasses of milk to obtain the amount of vitamin D a light-skinned person can make in 20 minutes sunbathing. The majority of Americans are vitamin D deficient, with a 25-hydroxy D blood level <20 ng/ml, or insufficient, with a level of 20—<30 ng/ml. Cheap vitamin D supplements (D3, not D2) provide the only way most of us can maintain a year-round vitamin D blood levels greater than 50 ng/ml. That requires taking 4—5,000 IU of vitamin D a day (50,000 IU every ten days or 150,000 IU a month). Taking vitamin D in these doses is safe, far safer than a flu shot with all the bad chemicals it contains. Concerns about vitamin D toxicity are overblown. One can take a 10,000 IU vitamin D supplement on a daily basis without any adverse effects. In healthy persons, long-term consumption of more than 40,000 IU a day is necessary to cause an elevation in the blood calcium level (hypercalcemia), the first manifestation of vitamin D toxicity (Am J Clin Nutr 2006;84:694—97). Check your vitamin D (25-hydroxy D) blood level. People with granulomatous diseases like sarcoidosis should also check their blood level of 1,25-dihydroxyvitamin D, the active form. Can a shot (or tablets) of vitamin D prevent influenza better than a flu shot? There is good reason to believe that it can. Doctors in India and Canada give people a once-yearly injection of 600,000 IU of vitamin D (MJA 2005;183:10—12). That would be better, and safer, than having a flu shot. Daily, weekly, or monthly vitamin D tablets work just as well. For more on this subject see my article “Vitamin D in a New Light” and visit Dr. Cannell’s Vitamin D Council website. Investigators have completed one double-blind, randomized, placebo-controlled trial that shows vitamin D prevents colds and influenza significantly better (P <0.002) than a placebo pill (Epidemiol Infection 2007;135:1095—6). A large multi-center randomized trial conducted over multiple flu seasons comparing vitamin D to a flu shot can show conclusively which is better, and safer. But given the financial stakes underpinning flu shots, and unpatentable vitamin D, who will fund it? In the meantime, considering what is most likely to be the outcome of such a trial, if it is ever conducted, I recommend that you avoid flu shots and take vitamin D instead. Influenza virus Flu viruses are classified into types A, B, and C. Type A viruses cause most influenza epidemics. They exist, replicate, and mutate in swine and horses; seals, dolphins, and whales; migratory water birds, geese and ducks; domestic birds chicken and turkeys; and humans. Type B and C viruses exist only in humans and only type B causes (relatively mild) infections. Influenza A viruses are further categorized into subtypes on the basis of two surface antigens (proteins): hemaglutinin (H) and neuraminidase (N). There are 15 different H and 9 different N antigens. The 1918—19 Spanish flu pandemic was caused by an H1NI Type A virus. Subtypes of influenza viruses are further classified by the names of cities, states or countries, along with the year they were discovered. For the 2008—09 (northern temperate zone) season, officials predict and have directed vaccines to be made against A/Brisbane/59/2007 (H1N1), A/Brisbane/10/2007 (H3N2), and B/Florida/4/2006. In an unusual departure, they are all different from the previous season, which missed the strains that caused influenza that season. What doctors diagnose as “influenza” is often an influenza-like illness caused by a respiratory virus other than the flu. Serologic tests are necessary to prove that one’s respiratory illness is actually caused by the flu virus. Other things to do to prevent the flu Avoid sugar. It suppresses immunity. Avoid Omega-6 vegetable oils (corn, safflower, sunflower, peanut, canola, and soybean oil). Americans consume 50 times more of these oils than are necessary for good health. In this amount they are powerful immune suppressants. Take a well-balanced multivitamin/mineral capsule on a daily basis. Eat garlic. Manage stress. Exercise. Get enough rest. And wash your hands. Viruses spread most often from touching contaminated objects, like doorknobs, phones, shared computer keyboards, and shaking hands. Your article is very interesting. Every year I go thru the ridicule of being one of the few who does not get the flu shot because I’m allergic to the eggs used in the process of making the shot. Over and over I hear how irresponsible I am…I just don’t know how to handle all the criticism. Any suggestions? Thank you!